In 1891, the subdistricts were re-organized and the parish placed in the Marton sub-district of the Gainsborough Registration District. 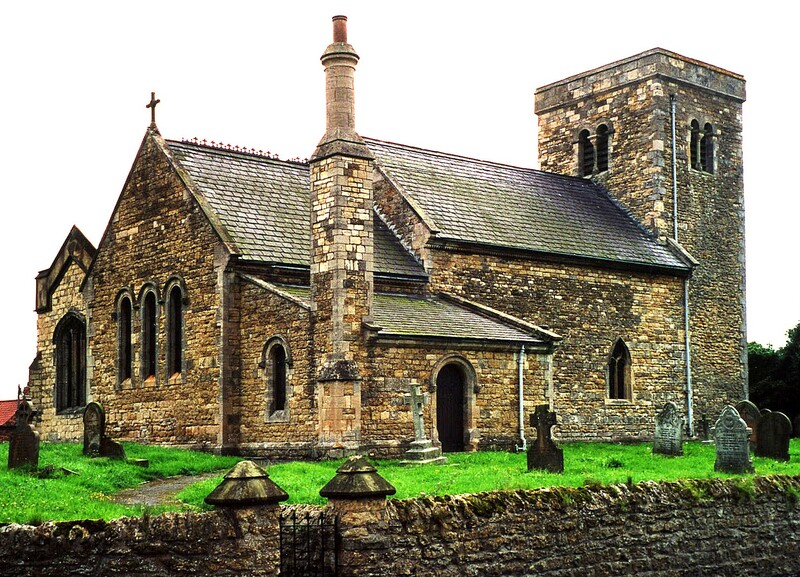 You can also perform a more selective search for churches in the Springthorpe area or see them printed on a map. The Anglican Parish Church is dedicated to St. George and St. Lawrence. This is the only church in England with this dedication. The origin of the church is uncertain. The tower is reputed to be Saxon, pre-Conquest. There is a story that a young girl named Mary HILL died on Shrove Tuesday in 1814 when she pulled one of the bell ropes and was dragged up against the belfry floor above. In a glass case just inside the Norman doorway is the Maiden's crown. This is one of three carried at her funeral by three maidens dressed in white. They also carried three garlands and three white gloves. These garlands are carried at the funeral of any unmarried girl and are a symbol of chastity. The church was restored in 1865 and again in 1876. Richard CROFT has a photograph of the church nave on Geograph, taken in May, 2008. The Anglican parish register dates from 1558. The Primitive Methodists built a chapel here in 1831 and replaced it in 1898. For information and assistance in researching these chapels, see our non-conformist religions page. Springthorpe is both a parish and a village about 4 miles east of Gainsborough and 9 miles south of Scunthorpe. The parish itself is bordered on the north by Corringham parish, on the east by Willoughton parish, to the south by Heapham parish. The parish covers around 1,300 acres and includes the hamlet of Stourgate. Take the A631 trunk road east out of Gainsborough and turn right immediately after Corringham. The village is about 3/4 of a mile ahead. Ask for a calculation of the distance from Springthorpe to another place. You can see the administrative areas in which Springthorpe has been placed at times in the past. Select one to see a link to a map of that particular area. RAF Sturgate opened here in September, 1944. By then, the war had moved to mainland Europe, so no operational sorties were flown from this field. It did however serve as a training site for a number of units. RAF Sturgate closed in January 1946. The airfield reopened in June 1953 as a USAF Strategic Fighter Wing. Military operations cesed in 1964. A portion of the airfield is now operated by the Lincoln Aero Club Ltd. The Control Tower has been referbished and the field now operates as Sturgate Airport. The parish is also in the Soke of Kirton. Check out Springthorpe Village website for the Lay Subsidy Roll of 1327 and the Survey of Kirton Soke, 1616. The citizens of the parish do not wish to have a formal Parish Council so they schedule periodic Parish Meetings to decide civic and politial issues. A charity was established by Thomas WEST and James and Sarah HILL, based on interest from £21, to be distributed to the poor. After the 1834 Poor Law Amendment Act, this parish became part of the Gainsborough Poor Law Union. A Public Elementary School was built here in 1872 for 60 children. It was later enlarged to hold up to 100 children. The parish has an online list of pupils, but I have no idea how far back it goes.